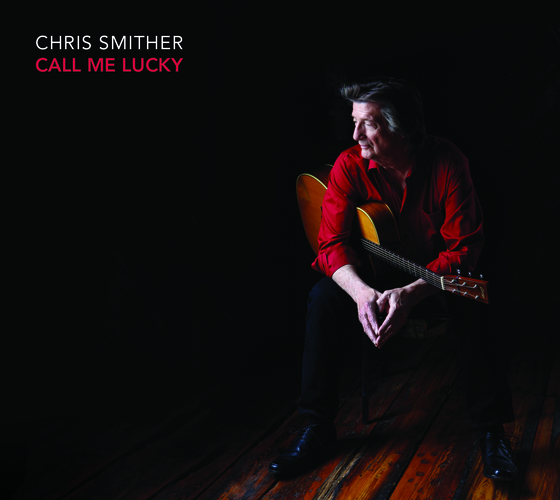 Album Review: Chris Smither, "Call Me Lucky"
Recorded at the gorgeous Blue Rock Studios in Texas’ hill country, just outside Austin (in Wimberley), Smither’s 18th album (! ), titled Call Me Lucky, on Signature Sounds/Mighty Albert (and distributed by Redeye), is the artist’s first studio recording of brand new originals in six years. Once again, Smither turned to his long-time producer and multi-instrumentalist David Goodrich, drummer Billy Conway (Morphine), Matt Lorenz (a.k.a. The Suitcase Junket), and engineer Keith Gary. The four musicians went into the session to record ten songs. What they ended up with is a double record: Disc 1 features the eight originals and two covers they started with; Disc 2 catapults the very same songs — with what life-long fans may know as “the Smither sound” — into another dimension, featuring very different arrangements. From the opening track on disc one of “Blame’s On Me”, with its deep honkytonk feel, the album is off and running with a home-y vibe. The slightly slurred vocal delivery and the cascade of acoustic guitars are rich and honeyed – a perfectly sweet combination. “Down To The Sound” is an elegant, haunting piece with a gorgeous melody and a thoughtful lyric; “By The Numbers” has some lovely acoustic guitar figures and, again, a meaningful lyric – philosophical and full of perspective while “Change Your Mind” has a foot-stomp, singalong texture as it reaches back to Mr. Smither’s blues and folk roots. The sly and bluesy “Nobody Home” offers an interesting perspective of trying to find your place in modern times and on “Lower the Humble,” Mr. Smither raises his own bar when it comes to songwriting, in the structure, the melody, the performance and with the words, which he evidently puts a great deal of effort into (something I feel is key – far over music). With disc 2, I can’t describe the incredible arrangement of “She Said She Said” (yes, THAT one); it makes the song his as well as taking on a different context from what we already know; masterfully done. “Everything On Top” is vastly different from disc one’s version – this simply rocks and rocks hard, exploding out of the speakers while “Down To The Sound”, while still a magnificent track, has a much more pop and galloping feel as “Nobody Home” has a stripped down, more percussion-driven backing with Mr. Smither’s voice completely unfettered. Chris Smither is a veteran; a master – and even after eighteen albums, he still knows how to write and perform songs that can touch you, move you, make you think and smile. This album offers comfort; take it and embrace it fully.